Working as an investment banker in London, founder Ingo Braeunlich, was tired of wasting a whole day of healthy eating by late-night snacking. When having to work until 2-3 o’clock in the morning snacks high in sugar, carbs and fat, like chocolate and crisps, were available only. Ingo wanted to change this and started Adonis Smart Foods to address the lack of healthy snacks. Their brownies, blondies, and greenies are handmade from natural or certified organic ingredients. They are also vegan, gluten-, soy-, and dairy-free, ultra low in carbohydrates and with only 2% of naturally occurring sugar. 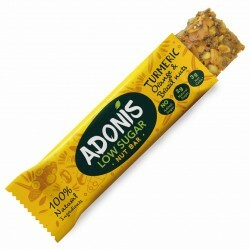 Adonis Smart Food's ultra low carb snacks make it easy to follow a healthy or low carb diet and get over the mid-afternoon cravings, without the guilt that follows.